The rise of the “foodie” book is one of our favorite new developments in kidlit, and this spring/summer is seeing the launches of two foodie-themed OneFour titles! 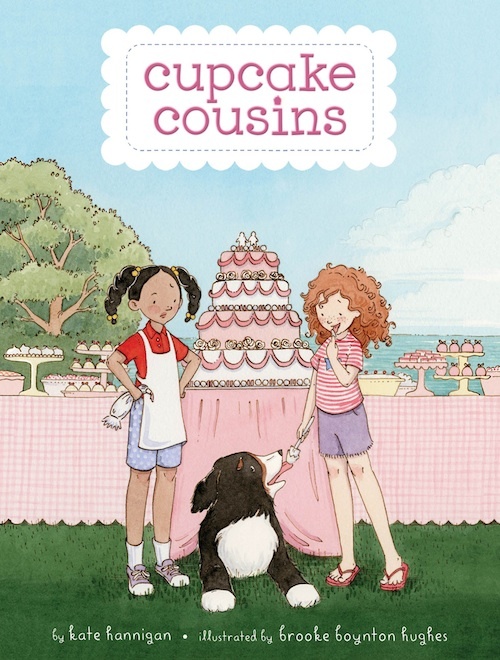 Cupcake Cousins by Kate Hannigan (Disney-Hyperion, May 13) tells the story of fourth-graders Willow and Delia, two cousins who are hoping that their skills in the kitchen will earn them a promotion from flower girls (bleh!) to pastry chefs (yum!) 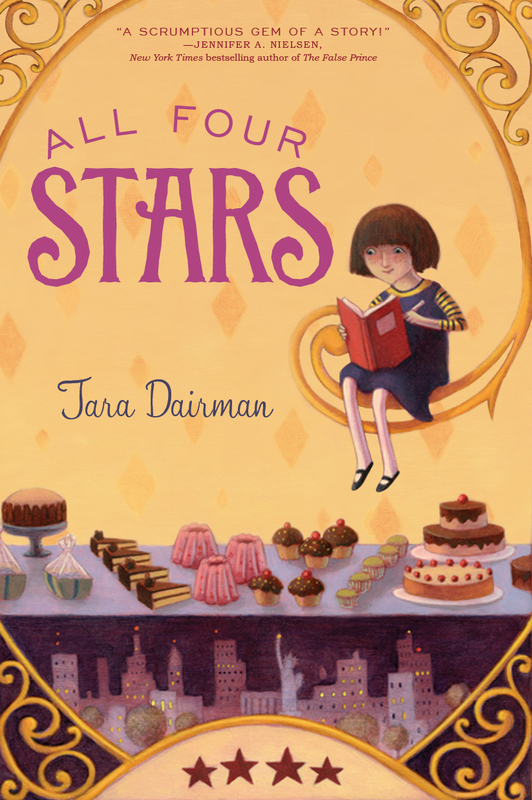 for their aunt’s wedding, and All Four Stars by Tara Dairman (Putnam/Penguin, July 10) introduces sixth-grader Gladys Gatsby, who secretly becomes a restaurant critic for the all-powerful New York Standard newspaper. Kate and Tara came together to answer four questions about food, writing, and the celebrity chefs who changed their lives. What could be more delicious? Why are your characters so interested in food? Tara: Gladys’s interest in food definitely springs from my own experiences. When I conceived of her character, I was in my mid-20’s, living in New York City, experimenting with recipes in my apartment’s tiny kitchen and trying new restaurants whenever my budget would allow. It felt like quite the culinary adventure compared to my suburban childhood in a family of microwave and take-out addicts–and I thought that the tension between those two worlds might be an interesting backdrop for a kids’ story. Kate: And it’s funny because with the popularity of cooking shows, today’s kids are more exposed to the idea of good food and wonderful recipes. So food is definitely a popular topic. My characters are so interested in food because my kids are. They want to experiment with the things they see on Cupcake Wars or Chopped. I found that when my daughter was in third and fourth grades, when friends came over, they wanted to bake cupcakes together. So a lot of what happens to Willow and Delia in my book comes from watching my own kids and their friends. Why did you focus on food with your book? Kate: I wanted to create strong and interesting girls who are deeply engaged in their interests. Girls “making and doing” and really living life. And I think cooking and food are easy access points for engaging kids. Who doesn’t love a cupcake? When kids get in the kitchen and start understanding what goes into the food they eat, they begin to take ownership of things. Not necessarily in big ways, but it’s laying a foundation for so much. Dumping in a quarter cup of this, one-third cup that, doubling recipes. Suddenly, they’re a whiz at fractions! When they see what binds together in a recipe, they’re gaining a sense of science in action. And there is so much pride in a dish well-served. I think cooking is an easy and fun way to help kids gain a sense of self – self-identity, confidence, and all those great traits that come with feeling competent in something. Plus, it’s fun. Tara: I love your reasons, Kate! I agree that kids have a great capacity for becoming deeply engaged in specific areas that intrigue them, so making Gladys somewhat obsessed with food and cooking was an easy choice. And on the reader side, well, we all have to eat, right? So a food-driven plotline seems to be something that any kind of reader can connect with, even if they’re not chefs or foodies themselves. Who has been the most influential person in your food life? Kate: My influences are more like a salad bar – I pick and choose this and that. So it’s hard to think of one person who had the most impact. But I will say that I am most inspired by Chicago restaurateur Stephanie Izard. She’s not only the executive chef of one of the city’s very best restaurants, Girl & the Goat, but she was also the first woman to win Bravo’s “Top Chef.” I have so much respect for her as she’s risen to the top in a male-dominated field. Anytime I have a reason to celebrate, I dine at Stephanie’s Girl & the Goat. She’s a remarkable woman and a great role model for girls who want to be chefs when they grow up. And she was nice enough to read Cupcake Cousins and comment on it for the book cover. What’s the coolest thing you’ve ever made/eaten? 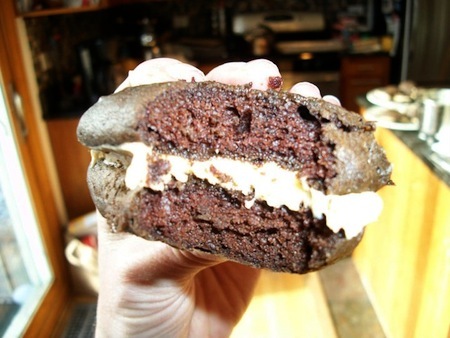 Kate’s whoopee pie coming at ya! Kate: I’ve gone dessert crazy in recent years, making a malted milkball cake I saw on Pinterest, insane chocolate-raspberry cakes at Christmastime, and Halloween cakepops for my kids (two October birthdays in our house). Plus I test all the recipes that are in Cupcake Cousins on my family over and over again. But the dish I’m most proud of making has to do with Julia Child. After watching the movie Julie & Julia, which featured Irma S. Rombauer (author of The Joy of Cooking) together with Julia herself, I was inspired to try Irma’s Boeuf Bourguignon. So in the same red French oven as in the film, I made the most amazing dish, complete with a French accent. It was a hoot, and I am still very proud of it. Though I’ve never attempted it again. . . ! Tara: Kate, you’ve got me drooling! When can I come over for dinner (and dessert)?? 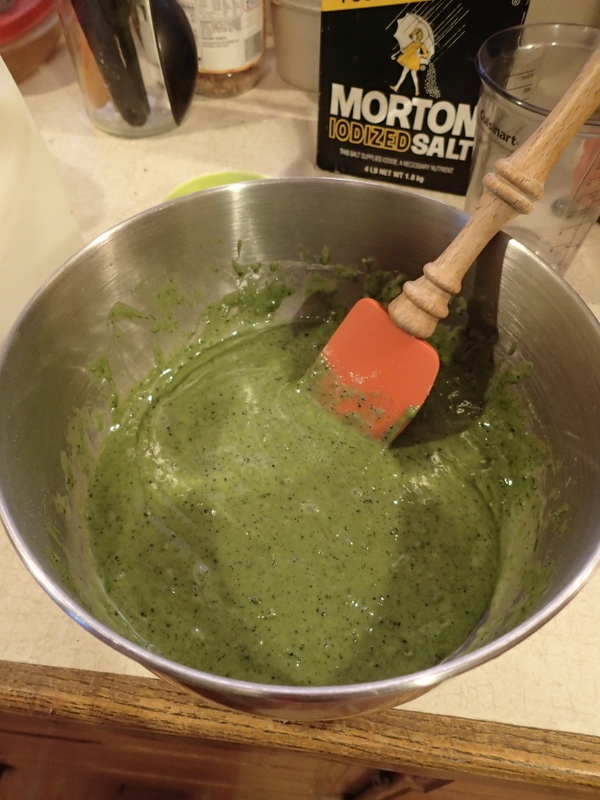 Tara’s green tea cupcake batter–it’s green! I’ve also been testing recipes inspired by All Four Stars on my family and friends over the past year (and will be sharing the results soon on my website). One of the wackier recipes I had to “invent” was green tea cupcakes with sesame icing. Matcha green tea powder and tahini (ground sesame seed paste) both have strong flavors, so it definitely took some experimenting to get the balance right. As for coolest thing I’ve ever eaten…well, I was lucky enough to spend two years backpacking around the world, so I sampled quite a few interesting dishes in that time. I’m not sure what to award the “coolest” crown to—hippo jerky (Zambia)? Fermented camel’s milk (Mauritania)? Donkey (China)? I’ll go slightly less exotic and choose pan de yuca—Colombian cheese bread. Found in Colombia, Ecuador, and a fantastic little bakery in Chelsea, Manhattan called Big Booty Bread (where they’re also called “cheese rocks”). If mac and cheese were a gluten-free bread, it would be pan de yuca. Yum. Find Kate Hannigan at her website, on her blog, or on Twitter! Find Tara Dairman at her website/blog, on Facebook, or on Twitter!